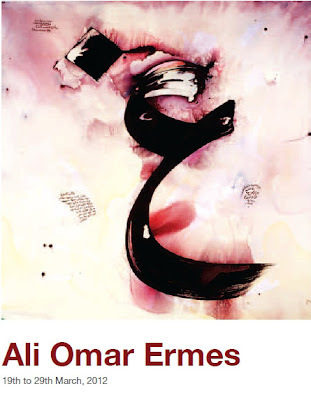 Born in Libya in 1945 Ali Omar Ermes was educated both in Libya and England. He skillfully fuses Arabic Script and contemporary Art, in doing so he has created new aesthetics. The Arabic letter is his source of inspiration; he also paints inscriptions from Arabic Poetry. He describes the poems as the medium between the visible movement of his painting and the cultural space, where these lines were created.